While they don't sound the best, the Aukey EP-B60 earbuds are still worth checking out for anyone looking for a pair of good gym earbuds that won't break the bank. They feature magnetic earbuds that snap together so you can let them dangle around your neck, and the auto-connect works nicely and is consistent. Who is the Aukey EP-B80 Wireless for? Fitness folks. The IPX6 certification paired with an emphasis on lower notes makes these great for anyone trying to push themselves at the gym. Anyone who prefers convenience to sound quality. 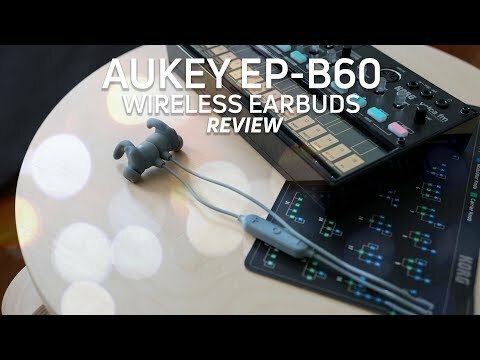 We should say right off the bat that these have an older sibling dubbed the Aukey EP-B80 which sound better but lack the magnetic housing that auto-powers the headphones on and off. The Aukey earbuds aren’t made of premium materials, but they’re not cheap either and look sleek. Starting with the build, the Aukey EP-B60 earbuds surprised me when I took them out of the box. They’re not exactly made from what I would call “premium materials,” but as someone who has used plenty of cheap, plastic earbuds over the years I was expecting more of the same here. Instead, these don’t look or feel half bad. The plastic control module and cable have a soft, rubberized feel to it that’s different from the glossy, cheap plastic found with some other earbuds in this price range. Plus, you get some pretty cool features for the price like magnetic housings that help the earbuds snap together when not in use. Not only is this useful for keeping them securely around your neck, but doing so also automatically powers the headphones on and off, which saves your battery life over time. While I’m not a fan of the branding on the side of my headphones, at least it looks cool. The earbuds themselves are also a nice size for both fit and aesthetics. I can wear these out in public or at the gym without feeling like they’re going to fall out or make me look like an idiot. Speaking of the gym, these are IPX6 water-resistant which means that they’re protected from your sweat as well. Although, I did have some issues with using these at the gym. As far as design goes, I start paying more attention to it than I normally would once a product passes the $20-$30 price range, and these do a pretty good job at hitting what I expected. I found that the ear tips that came with the earbuds did the job well enough for me, but you might have to give a few of the ear tip options a try before you find one that works well. The Aukey EB-B60 earbuds have wing tips that let them stay in your ear nicely. My two main gripes with these are the large control module that dangles from the right earbud and the long cable. The module looks nice, but it’s still fairly bulky. That said, the buttons work fine and are just clicky enough for me to not wonder if I pressed it correctly or not. The other issue I had was the cable connecting the two earbuds, which I think is a little too long even with the included cinch. Even after I adjusted the cable of the EP-B60 so that they fit me comfortably gave me a rat tail, which is never cool. As far as specs are concerned the Aukey EP-B60 are rocking Bluetooth 5.0. As I already mentioned the method of powering them on and off is by simply letting the earbuds magnetically snap together. It took some getting used to as I’m used to holding down the middle button on ‘buds like these, but once you do it’s really convenient. They turn off and disconnect instantly, and then when you want to use them again, they power on and connect to your phone just as smoothly. The control module gives you all of the basic playback controls and buttons have just the right amount of click. The problem here is connecting to more than one device, as it’s going to auto-connect to the last device every time. If you want to seamlessly switch between more than one device, this probably isn’t for you. It isn’t impossible, it’s just not automatic. Now, if you’re like me and will most likely only use this with your phone while commuting or at the gym, then the auto-connect feature is super convenient. That said, I experienced occasional skips and stutters when the phone was in my pants pocket. If I had my phone my coat pocket or directly on top of the treadmill, I didn’t have any issues at all, though. It isn’t as bad as true wireless connectivity, I just want to stress that it isn’t perfect. The earbuds have a magnetic on/off switch that auto-connects to the last device. As far as playback controls go they worked fine for me. The volume buttons worked accordingly, and the multifunction button in the middle lets you pause or play music as well as answer phone calls. Hold down the volume up button to skip to the next track and the minus button to return tota previous track. Aukey claims a battery life of eight hours of constant playback, and in our testing, we got just under that at seven hours and seven minutes. It isn’t bad, but keep in mind that was at our regular testing level of 75dB(SPL), so if you pump up the volume to be even louder (we don’t recommend going past 85dB), then you’re going to drain your battery quicker. Luckily, they do have quick-charging so a quick ten minutes on the charger should get you a little over an hour of playback. The ‘buds charge via USB-C which is great. On the bright side, these charge via USB-C which is a delight to see on a pair of ‘buds at this price point. I recently switched from an older MacBook Pro to a newer Huawei Matebook and have finally reached a point where a single cable can charge my headphones, laptop, and phone and it’s great. So kudos to Aukey for taking initiative and future-proofing its ‘buds. As far as sound quality, these are a little all over the place, so we wouldn’t recommend them for any kind of critical listening. That said, they do have a good emphasis on bass notes which means that anyone looking for a little extra push at the gym will find that useful, even though they are lacking clarity. People listening to these may enjoy the emphasis on lower notes in their music. Isolation isn’t that great here, and low rumbling is going to come through. Bass notes end up masking some of the lower mids, clashing with the vocals of the song Generator ^ First Floor by Freelance Whales. While the bassline wasn’t too easy to follow due to a lack of clarity, the thumping bass kicks were fine. Some of the detail in the cymbals is maintained in the song Horchata by Vampire Weekend, but only when there are no drums in the way to take all the attention. Otherwise, cymbals and other treble frequencies are easily lost. Again, not a bad sound signature for pushing yourself in the gym, but otherwise you’re probably better off getting the Aukey EP-B80 which have better quality Bluetooth codecs for streaming and a more uniform distribution of power (i.e. notes throughout the frequency response sound more equal in volume). Deciding if you should get these come down to a few key features. Basically, how important is auto-connecting and sound quality to you? For $20 more you can get the Aukey EP-B80 and get basically all of the same features plus better sound quality. Still, those don’t have the magnetic smart on/off switch built into the earbuds which I have to admit I love, so if you prefer the convenience of auto-connecting, want a stronger bass in your headphones, and also don’t mind saving $20 in the process, then these might be for you.